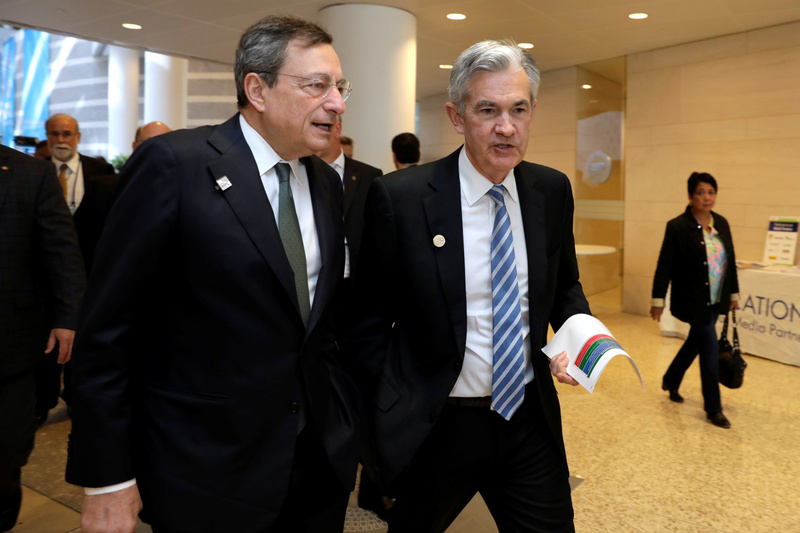 European Central Bank (ECB) President Mario Draghi (L) and Federal Reserve Chairman Jerome Powell walk during the IMF/World Bank spring meeting in Washington, U.S., April 20, 2018. The U.S. personal consumption expenditures price index rose 1.8 percent in November 2018 compared with a year earlier, the U.S. Department of Commerce said on Dec. 21. That was lower than the 2 percent reported for October 2018. The euro zone annual inflation rate for January was 1.4 percent, according to an early estimate published on Feb. 1 by Eurostat, the European Union statistics office. That was down from 1.6 percent in December 2018.